Life is made up of encounters. Barcelona is one of those magical cities that has made its mark on the story of Sylvie Ganter and Christophe Cervasel, founders of Atelier Cologne. Combining the Mediterranean lifestyle and exuberant creative energy, this cultural capital radiates well beyond its borders. While at the Majestic Hotel & Spa Barcelona, an institution in the Catalan capital, the classic elegance of the suites “impériales” in which they stayed, coupled with the grandeur of this vibrant city, the idea of creating a new Cologne Absolue was born. Called Musc Impérial, a sophisticated yet bright elixir captures unique clary sage and bergamot in the warmth of seductive musk. For the first time, a Cologne Absolue to be worn will also become the olfactive signature of the Majestic Hotel & Spa Barcelona. There are 10 reviews of Musc Impérial. Atelier Cologne is the unlikeliest of houses to intentionally make an "Aventus Clone" to capitalize on the social Darwinist hysteria that is the rabid online fan base the stuff carries, since it isn't even a house that supports gender in fragrance let alone status or pedigree. In fact, if not for Atelier's above-the-norm prices, one might not even suspect them of being a niche house at all, since the heart of their operation is to make simple colognes that last like a perfume. I'm not entirely on board with the Atelier Cologne corporate message, because to me it feels like they're really just making standard eau de toilettes (or what used to pass for them decades ago), then renaming and charging more for them, but I understand rising production costs for quality ingredients and all that, so maybe it just costs upwards of $150 for what used to be a third of that in ages past. What I do like is the general transparency of scents in the Atelier Cologne brand, and Musc Impérial (2015) is no exception. Sylvie Ganter and Christophe Cervasel cite inspiration from Barcelona and it's grand suites “impériales” within the Majestic Hotel & Spa Barcelona as inspiration for this fragrance, and I can see it. There is zero pineapple in this but what I think leads the "Jacobite" sect within the male side of the fragrance community to charge at Musc Impérial in defense of its appointed king Aventus is the black currant and bergamot head notes they both share, which combine in a very distinctive way that's hard not to associate with arguably the most popular niche in existence. Musc Impérial won't knock anyone's socks off, which is the one area Aventus actually bests it, since that most indomitable of Creeds does have a wow factor which love or hate is ever present. The opening of Musc Impérial is indeed similar to that of Aventus if it had no pineapple "shine" in its top notes, so what we get is a flatter, more aromatic smell that otherwise has the same dry citrus and dark fruit note but mixed with sage instead of more fruit. The smell of Musc Impérial quickly changes from there into something earthier than Aventus thanks to musty fig and a leather accord in the middle. Round French lavender dances throughout the whole thing at this stage, coming and going as lavender often does when it isn't playing a starring role in a fragrance, but as suspected, the root of Musc Impérial is indeed musk, but not a white musk molecule or any kind of "direct" musk as one might think with such a name on the bottle. Instead, Musc Impérial uses a naturally-derived version of musk ambrette coming from ambrette seed, rather than the stronger isolated molecule of old pulled from nitromusk creation. Scents like Chanel No. 18 (2007) or even Jacomo Silences (1978) made use of ambrette in this fashion, sometimes listed as "musk mallow" in note pyramids, and it is the prominent feature of Musc Impérial. A light dusting of cedar finishes this off, and a pleasant if somewhat forgettable glow is created which will last up to eight hours with the mild sillage for which Atelier Creation are known. If Musc Impérial does smell like Aventus by any appreciable degree, I'd say it's more of the "Hot Tub" version, since it really shines in humid environs or strait out of a steaming bath, making Musc Impérial live up to its namesake as a fragrance meant for enjoyment in the wee hours when unwinding with a good soak before bed. I also see this getting some day wear use in warmer months as well, since humidity is Musc Impérial's best friend. Musc Impérial is something of a misnomer, and it most certainly won't satisfy a hankering for any kind of real or substantial musk, like somebody after a tonkin musk type like Kiehl's Original Musk (1963) or a fatty vegetal type like Musc Ravageur (2000), or even an aromatic white musk like Jovan Musk Oil (1972), but who this will satisfy is somebody looking for a slightly-fruity aromatic leather and woods scent with a soft ambrette touch which imparts a tiny bit of pillowy sweetness to the mix. Naturally, this description is the furthest thing from what Aventus "dudebros" want out of a fragrance, since Musc Impérial doesn't scream "I bench 300lbs, drive a Maserati, run my own company and sneak into your house while your away to help you're wife cheat on you simultaneously" when a guy wears it. Instead, it just has the misfortune of having a semi-familiar top note accord then then goes somewhere COMPLETELY different within about ten minutes or so. Talk about a tease huh? Guess these alpha types aren't used to being teased are they? In any case, I like Musc Impérial so it gets a thumbs up, but wearing this invokes that spa atmosphere more than anything, living up to promises of conjuring exotic locals using a rarely-seen mixture of laid back perfumery staples and comforting ambrette, which is something most folks who compare it to other things seem to miss. If you are a guy who happens to enjoy Aventus but isn't afraid to experiment, this actually might be a smart bathroom spritz companion because they'd layer well together. For everyone else regardless of gender, this is nice, but just nice, so sample before paying the going prices Atelier fetches. There are a lot of Atelier Cologne options out there, and this sits squarely in the middle of them, but if the price is right, Musc Impérial might be a solid option for somebody needing a fragrance that comes across like relaxation in a bottle. Fruity opening that doesn't have much leather or wood in it, unless you spray it on your clothes. If I was going for a musc fragrance I would rather recommend Petit Matin, or Zegna Mediterranean Neroli. The fig replaces the blackcurrent giving it a creamy quality, and the lavender adds some dryness. It finishes off with a clean musk and wood. Another so-so fragrance. It's more sweet on my skin than on a shirt. Easily complimented! And I really like this stuff. Some reviews make an Aventus comparison - I may say it's a kind of hollowed-out Aventus, more ephemeral. A great tutti-fruitti fresh opening (pineapple-cubes, blackcurrant, lime). Masculine, modern, clean. Apparently inspired by / created for a posh Barcelona Hotel - it is indeed urban smelling: think cold limestone plaster walls in an old apartment block. It must be the fresh fruit against the clean musk that goes alkali-chalky in this way. Modern, fresh, masculine, above-all interesting! Oh my, we have a scrubber! This doesn't happen to me very often, but this I have had to wash off about an hour after applying it. Despite its name, Musc Imperial does not smell of musk to me, or maybe I never got to that part. It opened with a milky-fruity accord that reminds me of a virgin version of a tropical cocktail. After reading the notes, its probably the fig that's giving me this impression. Fig, especially when it's the creamy kind like in Philosykos, often gives me a pineapple and coconut association, and I usually like it. Here, however, it's become both sickly and watery, like someone attempting to make a Pina Colada with coconut flavored water and pineapple syrup rather than with the real deal. This unfortunate fruity accord is made unbearable by something I would describe as an aquatic woody impression (think cheap mens' body spray) that increases in strength as time goes by. This squeaky clean accord merges with the faux cocktail and becomes a nausea inducing mess on my skin. I actually started to feel a bit queasy, so I tried to wash it off but it's quite persistent. I layered a good spritz of Chanel Sycomore (blasphemy!) over it, which seems to mask the unpleasant olfactory remnants somewhat. Phew. Compared to the rest of the Atelier Cologne's I've tried this is a big dud. There are no member images of Musc Impérial yet. Why not be the first? 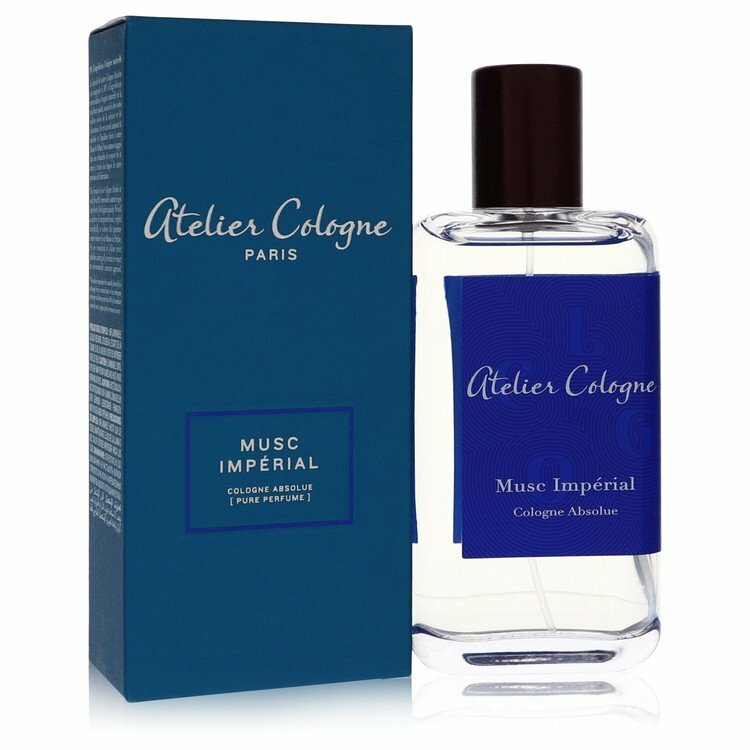 New Atelier Cologne Musc Imperial! - Just Received It - First Photos! !